Maxi Ginkgo Biloba is a 24% Ginkgoflavonglycosides, standardized extract. Meet your nutritional support goals with a name you can trust. 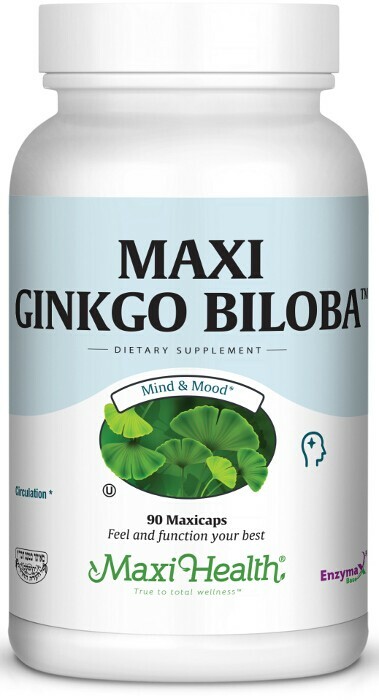 Get Maxi Ginkgo Biloba™ from Maxi Health. Take one (1) to two (2) Maxicaps™ daily, preferably at meals, or as directed. Microcrystalline cellulose, vegetable cellulose, magnesium stearate, Enzymax® (calcium carbonate, bromelain, papain, lipase, amylase, protease, silica). This product contains no animal products, soy, wheat, gluten, sugar, salt, yeast, milk, artificial flavors, colorings or preservatives.